Gotta hand it to Maxine Waters , the California Congresswoman has never met a Republican she didn’t hate, or a corrupt liberal movement she didn’t love, but that doesn’t stop her from spewing her venom in public. Ms. Waters has been feasting on her hatred of Donald Trump ever since he won the election, saying she would never meet with or work with the new president, and going even further calling for his impeachment. But it’s not the President trying to get rich off the public dime, it seems that Ms. 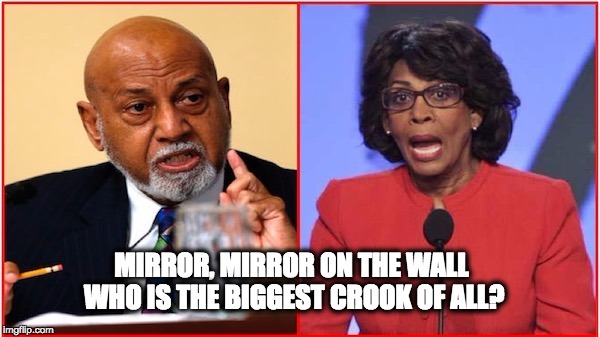 Waters is trying to compete with colleague Alcee Hastings (D-FL) for the retired Charlie Rangel’s title of the most corrupt person in the House of Representatives. The Washington Free Beacon is reporting that Karen Waters has been paid over $600K by her mother since 2006, the bulk of that money coming from campaign dollars. The daughter of Rep. Maxine Waters (D., Calif.) was paid nearly $70,000 by her mother’s campaign during the 2016 election cycle. Karen pulled in $65,287 overseeing the slate mailer operation in 2016, making her the third-largest recipient of Waters campaign funds that cycle. Karen, together with her firm Progressive Connections, has received over $600,000 in payments from the Waters campaign since 2006. In 2010 Waters was accused of helping an unsound bank (OneUnited) receive government aid to help her husband who was an officer and stock-owner of the bank. She avoided any problems by throwing her grandson under the bus. OneUnited was financially reeling from the federal government’s takeover of Fannie Mae and Freddie Mac, both of which had their shares wiped out by the government action. OneUnited owned substantial shares in the two mortgage giants, Frank said…. Regulators also complained of “excessive” executive pay at OneUnited – including a Porsche for use by CEO Kevin Cohee…. The e-mails show that Mr. Moore was actively engaged in discussing with committee members details of a bank bailout bill apparently after Ms. Waters agreed to refrain from advocating on the bank’s behalf. The bailout bill had provisions that ultimately benefited OneUnited, a minority-owned bank in which her husband, Sidney Williams, owned about $350,000 in shares. In the end Maxine Waters avoided the ethics charges by getting her Grandson and Chief of Staff, Mikael Moore to take the fall. Grandchild Moore got off with a “letter of reproval.” Waters got off despite the fact that she requested the bank bailout money for a bank where her husband owned stock and had served on the board of directors.” At the time she requested the help, Waters neglected to tell Treasury officials about her financial ties to OneUnited Bank. I bet her grandson got a nice gift for Christmas that year. Right now her colleague Rep Hastings has the jump on her for the most corrupt title. Near the end of March Constitution.com reported that Alcee Hastings (D-FL) had become embroiled in a corruption scandal that saw him paying his girlfriend over $2.5 Million over the last 20 years. In Hastings case, this isn’t the first branch of the federal government he “served.” Before he was in Congress, Hastings was a federal judge. But in 1988, the Democratic-controlled U.S. House of Representatives impeached Hastings for bribery and perjury in a close vote of 413-3. In 1989 was convicted by the U.S. Senate and removed from office.